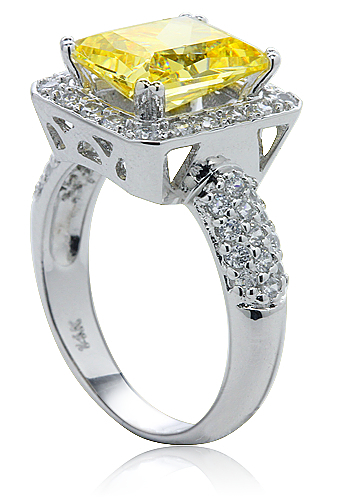 The Montgomery 4 Carat Emerald Cut Halo Micro Pave Cubic Zirconia Ring features a 4 carat 10x8 mm canary yellow diamond look emerald radiant cut framed by a single row halo of micro pave set round man made cubic zirconia. 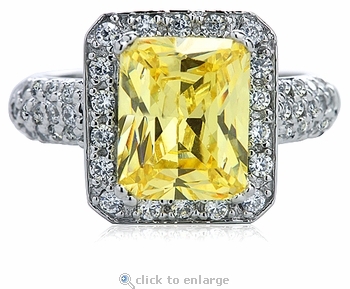 Additional micro pave set round diamond quality cubic zirconia are hand set halfway down both sides of the shank in a slightly domed fashion to beautifully accent the halo accented center stone. 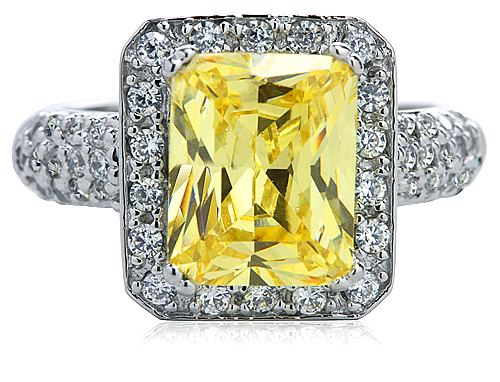 The shank on this beautiful vivid canary yellow ring measures approximately 4mm in width and includes approximately 5.30 carats in total carat weight of the finest hand cut and hand polished original Russian formula cubic zirconia. 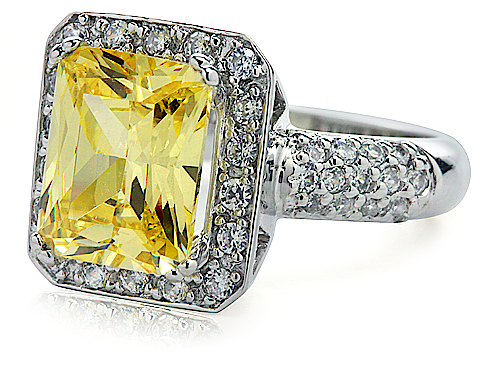 The Montgomery Ring is also available with a diamond look center stone in addition to other colors like blue sapphire, red ruby, and green emerald. Please see the pull down menu for options. For further assistance, please contact us directly at 1-866-942-6663 or visit us via live chat and speak with a knowledgeable representative.